British Gold coins are famous all over the world due to their extensive history, classic designs, and high gold content. The oldest mint in the world, the Royal Mint, has produced some of the most remarkable gold bullion products available on the market, such as the British Sovereign Gold Coins and the British Half Sovereign Gold Coins. These coins were made of 22-karat pure gold and were minted between 1817-1917. They have minted again in 1925 and from 1957 to the present day. 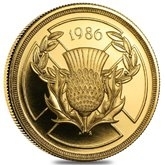 One of the most popular British Gold Coin designs is the Gold Britannia released in 1987. It was made of 22-karat .9167 pure gold and bore one of the most recognizable British figures – the Lady Britannia. These coins feature different depictions of Britannia and since 2013, are struck from .9999 pure gold. Another very popular collection of UK Gold coins, introduced in 2014, is the Royal Mint Gold Lunar Series, which commemorates the Chinese Lunar Calendar by consecutively depicting each calendar animal on the reverse side of the coin. The series was designed by the British-Chinese artist Wuon-Gean Ho. 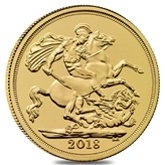 These British Gold Coins are manufactured of .9999 fine gold with the first issue being the “Year of the Horse” and the current one being 2018’s “Year of the Dog”. These coins are minted in limited editions, making them highly appealing to collectors and investors worldwide. The Royal Mint is the oldest mint in the world, with its history dating back to 886 AD, it witnessed many wars, different empires, and changing technologies. During its first years, the mint was represented only by the London Mint, although there were several other mints within the British Kingdom which were ruled by Alfred the Great. In 1279, the headquarters of the Royal Mint was established in the Tower of London and remained at that location for over 500 years. In the 16th century, the Royal Mint achieved monopolization of coinage production. In 1696, Sir Isaac Newton was designated as the Warden of the Mint and was responsible for identifying counterfeited coins. He was later appointed as the Master of the Royal Mint and carried this status until he died in 1727. In 1809, because of the lack of space in the Tower of London and the ongoing war with Napoleon’s France, the British Mint decided to move its location to London’s East End. The mint’s structure has been rebuilt several times to accommodate the mint’s constant growth, but its redesigns lasted only until 1967 when it was relocated to Llantrisant. Finally, the British Mint became a trading fund at the end of the 1980s and in 2009 was acquired by Her Majesty’s Treasury, being turned into a limited company. British Gold coins are minted in several design and weight options. Gold Britannia coins are available in 1/10 oz., ¼ oz., ½ oz. and 1 troy oz. weight options with .9167 gold purity, for the editions up until 2012. 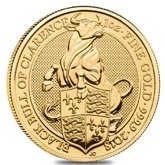 As of 2013, Gold Britannia’s are struck from .9999 pure gold, with three additional weights of 5 oz., 1/20 oz. and 1/40 oz., being the smallest British coin. Gold Lunar Series coins are produced of .9999 pure gold and are available in 5 oz., 1 oz., ¼ oz. and 1/10 oz. size options. The original British Sovereign Gold Coins minted are produced of 0.2354 oz. of pure gold but are also available in several weight options of 0.0588 oz., 0.1177 oz., 0.4708 oz. and 1.1775 oz. British Gold Sovereign Coin carry several designs, the first features the British Shield and crown motif, encircled by a heraldic wreath. Modern British Sovereign gold coins depict the image of St. George killing a dragon, created by the Italian engraver Benedetto Pistrucci. On the reverse side of the coin is always depicted the profile portrait of the British sovereign, at that time, including King George II, King George IV, King William IV, Queen Victoria (three designs), King Edward VII, King George V and Queen Elizabeth II (three designs). Gold Sovereigns have been struck from 1817-1917, in 1925 and from 1957 to present day. 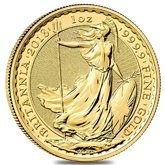 The obverse design of the Gold Britannia coin features Lady Britannia, standing with a trident and shield in her hands. This representation is a symbol of freedom and prosperity to the British nation. Lady Britannia has been depicted on coins for thousands of years, dating back to the Roman Empire. Her representation on this outstanding coin has been redesigned several times during the coin’s striking history: the Standing Britannia (1987-1996), the Charioteer Britannia (1997), the Britannia & The Lion (2001), the Helmeted Head Britannia (2003), and the Seated Britannia. The obverse side of these coins has always featured a profile portrait of Her Majesty Queen Elizabeth II in several versions: the “Third Portrait” for Gold Britannia’s issued between 1987-1997, the “Fourth Portrait” for coins issued up until the 2014 Gold Britannia editions, and starting with the 2015 coin, the more mature “Fifth Portrait” of Her Majesty, designed by Jody Clark, is used for these remarkable coins. British Gold Lunar Coins feature unique depictions for each of the 12 Chinese Zodiac animals. 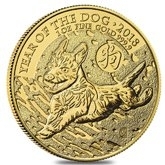 Gold Lunar Series coins started with the “Year of the Horse” Gold Lunar coin in 2014 and continue to this day with the “Year of the Dog” gold coin. Each of these coins reverses sides have been designed and created by the remarkable British-Chinese artist Wuon-Gean Ho. The next gold coins within the series are expected to depict the following Chinese calendar symbols: the pig, the rat, the ox, the tiger, the rabbit, the dragon and the snake. If you have any questions about these remarkable pieces of the British Gold coinage, please feel free to contact us at 800.852.6884. You can also reach our friendly and helpful Bullion Exchanges customer service associates online through the use of our live chat feature, or by email at info@bullionexchanges.com.